If you or a loved one has a disability or is elderly, you know the importance of members of the elderly and disabled communities being able to travel. It gives them a sense of freedom and individuality and shows them that they can still go places and have fun. Traveling is a fulfilling, rewarding experience that everyone should get the chance to have. Having a disability or being elderly should not get in the way of having a fun time at the destination of your choice. That’s why handicap accessible car service to the airport is so important. If you need a wheelchair or other transportation device to get around, you know that it can be difficult to get in and out of a car to drive to the airport to go on these trips. It is also important that people who are elderly or disabled maintain their independence and are able to get places on their own. That’s why the safety specialists at Cathay Express Transportation are here to help with our handicap accessible car service to the airport. Cathay Express Transportation proudly offers wheelchair accessible airport cab service for people who are elderly or have a disability. We understand how important it is for many people in the New York area to be able to travel for business, medical reasons, or to spend time with family and friends despite any medical conditions that might make travel more difficult. Our handicap accessible car service to the airport will take you or your loved one to exactly where you need to be dropped off in our fleet to assure a safe ride to the airport before the plane takes off. We specialize in non-emergency medical transportation for people who are elderly and disabled because we understand that people in these communities deserve to have just as much freedom and fun as those who do not rely on a wheelchair or other transportation device. 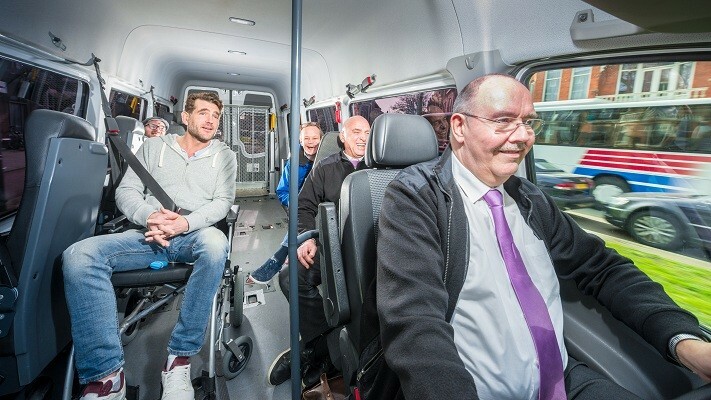 While we mainly provide medical transportation to doctor’s appointments and nursing homes, we pride ourselves in our other transportation services like our wheelchair accessible airport car service because they allow elderly and disabled people to get to the airport on their own and go on a relaxing trip. We provide our handicap accessible car service to the airport 24 hours a day, 7 days a week, because we understand that, along with people needing to get to destinations regardless of the time of day, flight times can be as early as 4 o’clock in the morning. No matter what time your plane takes off, we can assure that our airport wheelchair service can get you or your loved one to any airport in New York and beyond in a safe and timely manner. We are committed to providing the highest quality leisure transportation services in the area. Our wheelchair accessible airport car service allows anyone to enjoy traveling to go on a vacation on their own, with their family, or with their friends. If you or a loved one is elderly or disabled and wants to be able to go on vacation to a friend’s house, tropical destination, or wedding, don’t let a wheelchair stop you. Trust Cathay Express Transportation’s wheelchair accessible airport cab service to make your vacation dreams become a reality. Our goal is to remove boundaries for the disabled and elderly communities through our airport wheelchair service and allow them to enjoy all of the experiences that they want to have.